Edgehill is famous for being the area of the first battle of the English civil war in 1642. There are many monuments and references to be found locally and in particular in the Radway exhibition with references to the battles of the civil war. The Battlefield walk runs nearby as does Centenary Way. Although there are no footpaths on the site you can access two pathways which border the site. These pathways join a network of paths from which one can travel great distances. For the less energetic there is always the choice of any of these pathways which join shorter local paths. This provides access to local pubs and facilities where one can stop and rest whilst enjoying the food and beverages which they serve. Currently semi ancient woodlands scatter the hill side with an abundance of blue bells. Edgehill Country Park benefits from a small woodland on the slope with some ridge and furrow in the meadow at the bottom. 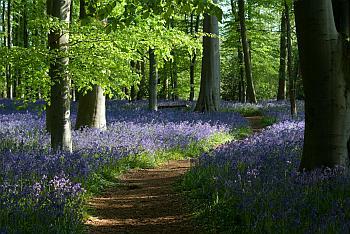 The woods are filled with blue bells in late Spring. The site is at the most northerly tip of the Cotswold Area of Outstanding Natural Beauty, an area which extends through Warwickshire and into Gloucestershire. Far reaching views across the Warwickshire countryside can be enjoyed from the edge of the camping site. Throughout the year you may see birds such as kestrals and buzzards, many insects such as butterflies and moths. You may also enjoy the sight of Rabbits, Badgers, Foxes and Deer. We would like the site to stay a natural environment and therefore all our activities try to adhere to this policy as much as possible. We ask visitors to take all their rubbish away with them. There is a small play area for younger children to enjoy and we ask that supervision is provided whilst it is being used, for the safety of the young people using it. In addition that you satisfy yourself of the appropriateness of the equipment for the user. We do encourage schools to utilise the site in the hope of helping to educate and inspire young people. The introduction of camping and the outdoors at an early stage in young people can create an everlasting interest.